In prehistoric times Axmouth was the most important harbour in the West of England, protected by the iron age hillforts of Hawkesdown and Musbury. The Phoenicians sailed into the River Axe and it was a significant port in Roman times. Ancient roadways all led to the harbour and the Fosse Way ended at Axmouth. The Danes landed an army under Anlaf in 937, but they were defeated in a large battle at Axminster by King Athelstan. The monks of Newenham and Sherborne fostered the growth of the harbour in medieval times. In the 14th century heavy storms caused part of Haven Cliff to fall and partially block the estuary, and the shingle bank started to build up. The silt brought down by the river was deposited in the estuary and serious problems developed. Attempts were made to repair the harbour, especially by Thomas Erle and his son Sir Walter Erle of Bindon in the 1600s, but their efforts were in vain. The Axmouth Harbour Act was passed by Parliament in 1830 and still governs its use today as a scheduled harbour. John Hothersall Hallett of Stedcombe, the lord of the manor, then constructed a new harbour at his own expense and this operated commercially until the railway came in 1868. 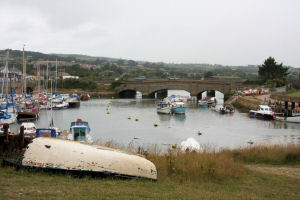 Severe storms in 1869 and 1914 destroyed part of the quay, the customs house and other buildings, and the opening of the Axmouth Bridge, the oldest surviving concrete bridge in England, in 1877 sealed the fate of the harbour. The Axmouth Harbour Management Company, which holds the lease from the East Devon District Council, has overall responsibility for monitoring, advising maintenance and development of the harbour area. The Harbour is actively managed against a policy of phased improvement whilst retaining its natural character. The Council made extensive repairs to the piling near the entrance during the winter of 2003/4. This followed the provision of a slipway on the Fish Quay side and a 20m extension to the Harbour arm in 2000. Members of the Axe Yacht Club have, in recent years, made considerable improvements to the mooring basin, by strengthening the banks and installing pontoons. The harbour is also used by a number of local fishing boats, which moor against the old north wall.